I had this crazy idea today. I’ve been really praying about this blog and how God wants me to use it. I don’t feel released to let go of it but at the same time, some weeks I just frankly don’t have time! In my personal life, I’ve really been trying to get into habit (or as my awesome pastor recently put it, a Spiritual rhythm) of reading my Bible every day right after my kids go to school. I can NOT tell you how much this has helped me. It isn’t even some grand message God has given me through the Word, but it’s the practice of, regardless of how busy the day is, starting it off by reading a bit of his word, praying for my family and my nation and all the other things on my heart. It just puts a different tone on the day than starting it with whipping out my giant never-ending to-do list. Now I do that AFTER I read my Bible, and it puts the importance of that list into a much better, more Godly, perspective! I’ve been getting into a habit of sharing a verse of the day on my author Facebook page most days from my Bible reading, but I’m thinking I might start doing that here — then invite you to chat about what it means to you. Even if we don’t chat, my hope is that if you stop in, you’ll get just a little dose of Jesus during the day. It’ll just be Monday through Friday, and I’m not going to do what the experts “recommend” and have it posted super early in the morning. it’ll probably be between 8 and 9-ish most mornings but sometimes later. And it won’t be some long devotional. It’ll probably just be a Bible verse most days and maybe a sentence or two to go along with it. Other days I might write a normal Krista blog and add the verse to the end. But it’s something I’m going to try, and I pray that it blesses YOU as well! So on to today’s verse! 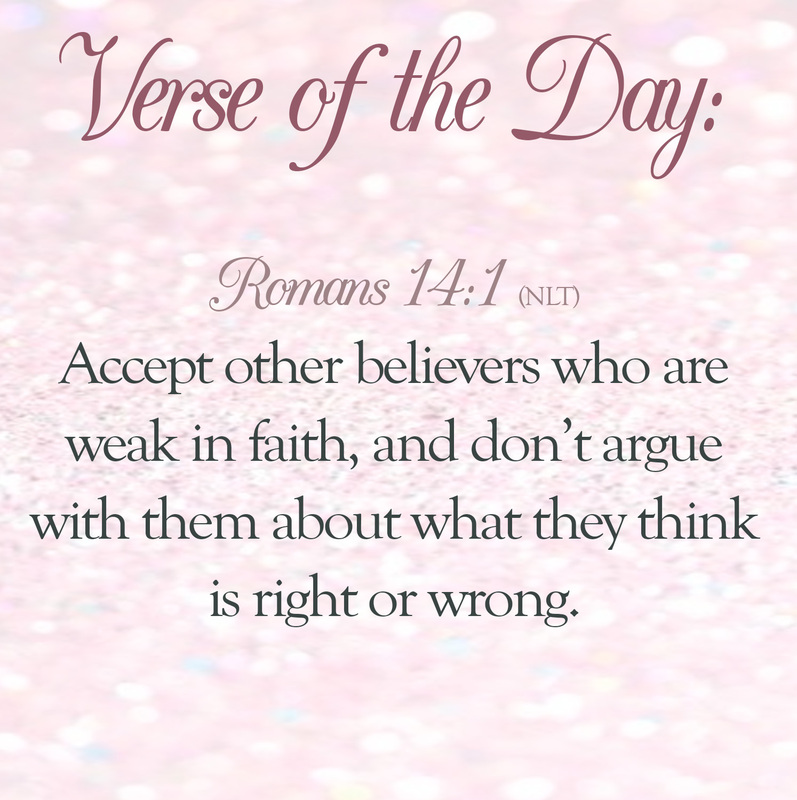 Romans 14:1 Accept other believers who are weak in faith, and don’t argue with them about what they think is right or wrong. SUCH a balance, isn’t it? To champion a cause, to stand up for what we believe in, but also to realize that arguing with each other isn’t what God intended. I’d love your thoughts on what this means to YOU! That verse is a great reminder. And that is a balancing act isn't it? To speak the truth, but not in such a way as to make the unbeliever turn away. Thanks for sharing that verse! It's also interesting to me that even in this verse, they aren't talking about unbelievers, but those "weak" in their faith or not to the point of their faith journey as those he is speaking to. I became a Christian at a very early age and have been raised in the church. My view on things is different than, say, Maddie in my first book who was raised in a very tumultuous environment and is very new to Christianity. Her actions may not all look very "Godly" to me, but she has a LONG journey with Jesus ahead of her, and a lot of growing to do. I think this is especially important on social media! Arguing about who does and doesn't have it right only makes everyone look bad… Much more important to spread the truth of His love and leave the finger-pointing out! Jessica!! Yes!! Social Media tends to loosen our lips a little and make arguing much "easier" than if we were doing it in person. I try to follow a "if I wouldn't say it to you in person, I won't say it on social media."